We are happy to inform those who are waiting first. 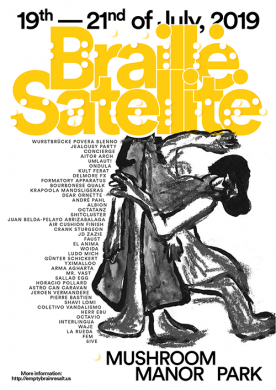 The third edition of Braille Satellite festival is upcoming. We have already announced 30 artists that are going to participate this year and there are around that much still to come. We try to keep the line-up in our direction and to bring all kinds of music genres and styles, including performances and dj’s of course! As well we are trying to advance bringing “big” names that are really worth attention and respect. Without you that would be impossible. Check out the line-up on our homepage. Tickets are available already. We are going to sell first ones for 40 Eur, but later on we are going to increase the price, because it’s unfair to pay 1 Eur per concert, we think. We hope to see all your faces in July and do the festival thing together. Stay alive till the Fiesta.